Spotted sea trout action is hot! Capt Kelly and I have had fin-nominal days out on the water. The trout bite has been very reliable and a popping cork and a live shrimp prove a deadly combination. Hopefully with the warmer weather and the water temps creeping back up into the mid to high 70’s we’ll see better bait showing up and more of our game fish species becoming more active. Topwater action is picking up for these aggressive little buggers as well. We have had some pretty good action slinging plastic in the past week. Topwater fishing is absolutely amazing and probably my favorite type of lure to throw. But, you’ve got to get the right motion or you’ll be wasting time. “Walking the dog” action involves a constant zig-zag movement of left, right, left, right, hard enough to activate the rattles but soft enough to keep the bait in the water. It might take a bit of practice to get it just right but it’s well worth it when it’s done properly. My favorite topwater selection would be the spook jr or spook one knocker both in the bone or trout color. Do yourself a favor and head on over to a great local sports store and talk to Malcom or Eric Cook at Cooks Sportland out on 41 in Venice. They have an amazing selection of baits, fishing supplies and whatever you need for your outdoor activities and have been doing so for the last 50 years. Grab a few of your favorite topwater baits and get to slinging. Like I said, my favorites are the spook one knocker and spook jr. Tell them Capt Jesse sent you and they’ll treat you like they treat everyone else… like family! You can find them at 4419 Tamiami Trl S, Venice FL (941) 493-0025. Snook, trout, and reds have spread themselves all around the flats and mangrove islands so keep an eye out for them because there are some biiiiggg snook out there. One thing you’ve got to remember about snook is they are very smart and have very distinct eating habits. The way I can best describe this cunning opposition is to compare them to cats. You can put his favorite food in front of him and if he’s not hungry he’ll turn his nose up and walk away. But on the other hand, if the conditions are right they’ll crush that bait like it was his worst enemy and he stole his woman. Recently, we’ve been catching them by soaking cut bait in the potholes and along mangrove shorelines. Chumming with live bait works if you can find the numbers needed this time of year. Here are a few more items I think are just as important as choosing what bait or place to fish. How about eye wear or sun protection. Now if you’ve visited the dermatologist in your lifetime then you know they’d have us become nocturnal, avoiding the sun as best as possible. But, contrary to popular belief, you don’t have to apply sunscreen so liberally that you look like a walking ghost. I’ve had folks onboard that caked so much sunscreen on throughout the trip I was nauseous at days end. Not to mention all of my gear, seats, tower and bait was coated with it as well. I have one small spray bottle of good quality name brand 100 spf non-greasy sun screen I use for my nose and face…that’s it. So having said that, the next best thing in my sun defense arsenal is my eyewear and sun protective clothing. I’ve used many different protective eye wear and I’ll be honest with you, not much difference between them all except for this new company I’ve been using lately. Salt Life optics… I’ve had the same pair since last summer and for someone like me to have a pair that long is really saying something. Now granted, they do get “weathered” but it’s the lenses that have captivated me. Salt Life sport optics with Zeiss lenses are another product that taken care of will last you quite a while. Regarding apparel, another new line that I recommend is the HUK performance fishing apparel, known as HUK gear (pronounced hook). It’s a really cool line of performance gear that I’m sure you’ve seen us wearing in some of our pictures. Check them out at www.HUKGEAR.com. If you’re ready to get out and see how Kelly and I do it, give us a call at 941-698-0323. You may also find us on Facebook, Instagram or our web page www.FloridaInshoreXtream.com. Well folks, you know the deal…gotta get on out and get my FIX on! So … tight lines and y’all stay safe!! Oh Boy… winter time blues!!! Well, I know it is really winter time when Kelly has on 5 or 6 layers of clothing and her waterproof gloves out. It may be cold, but if you look for the right places to fish, winter time can be very productive. Creek mouths are a great place to start. They have the 3 keys to finding fish that I always try to stress…food, moving water and cover. Get these 3 things together and you’re sure to find fish. There are several creeks along the west wall of Charlotte Harbor and even a few in Turtle Bay worth fishing. Throughout the creeks, there are deeper holes and stretches that you’ll want to target. Throughout the Harbor, sheepshead are still milling about and eating live shrimp cut into 3rds. Have plenty of shrimp because they are very good at getting your shrimp off the hook and leaving you fishing on credit. Another favorite bait for these buck tooth convicts would be fiddler crabs. Shrimp are in high demand right now at your local bait shops…so if you’re planning a sheepshead trip you might want to call or buy some a few days in advance. Redfish and snook seem to be about everywhere right now. They’re hitting shrimp, scented soft plastics and chunked lady fish or pinfish. Look along the shorelines in shallower water because they’ll move into the shallows as the sun warms up the water. If you have a shallow running boat, you may be able to venture in the back country and fish the potholes. 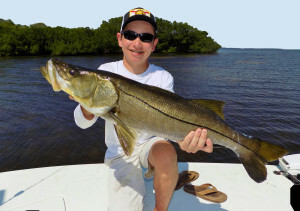 These are excellent spots to pick up trout, redfish, and snook. But, be very careful because we have had some very low tides and not many boats run skinny enough to get back there. So whatever you plan on targeting during your fishing trip, go ahead and pick up some shrimp because it is a catch all. Trout and other fun fish such as ladyfish are still abundant along the bars and in the pot holes mentioned previously. You’re more likely to find fish in those areas with shallow shorelines/sandbars adjacent to a deep drop off. They like these spots as it provides an easy transition from deeper water for finding food into shallower water for warming up. I would recommend deeper grass flats on these cooler months for trout. I would start with live shrimp on a light wire 4/0 circle hook under a Bomber saltwater grade paradise popper with 20 lb fluorocarbon. For leader length…you will want to fish mid to lower part of the water column, too deep and you’ll just be feeding the pinfish and if it’s too far off the bottom they’ll probably not expend the energy to go looking for it. Remember, the water temperature is hovering in the low to mid 60’s and warms in the latter part of the day. Most of our fish (like our residents) like it a bit warmer before they really get aggressive…so slow down on those retrieves. The good news is that most of the fish are easily accessible on most of the sandbars, shorelines and oyster bars. Don’t get too close to the bars or shoreline or you may pass over the fish. For all the fish we’ve seen along the shoreline, there have been just as many milling around in the 3-4ft range. So don’t rush immediately to the shoreline; stop in that 4ft range and fish your way towards the shoreline. For “fun fish” (jacks, ladyfish, trout, etc), look for bait schools and birds diving. This is usually an indication of fish in the area. Many times, they are all mixed in there together… sometimes you just have to weed through them to find the ones you’re looking for. A good, simple rig for winter time fishing is a live shrimp on a 1/4 or 1/8th ounce jig head. I like to remove the “fin” part of that shrimp’s tail, then feed the hook right where the fin was removed on the tail, letting the hook come out near the legs. Nearshore fishing has still been productive if you can get out past the red tide and its affects we’ve been experiencing recently. Mangrove and lane snapper have been plentiful on hard bottom around the 8 and 9 mile mark. Nearshore reefs will be holding sheepshead and occasionally schools of permit passing through. But, if you’re seeing large numbers of dead fish in the area you’re trying to fish, you might be in an area affected too badly by red tide. It has a funny smell and some people experience a tickle feeling in the back of their throat. In this case, pack up and try elsewhere because many of the target species of fish will have cleared out. But, like I said, if you’re able to push out to around 8 miles, you’ll start to find cleaner water and more fish.